There are so many famous historic characters and past events that have shaped the Boston you see before you today, and many of the city's oldest buildings and landmarks have truly fascinating stories behind them. 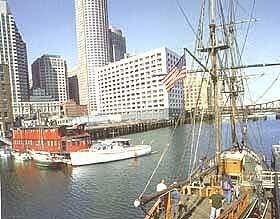 People like John Endecott, John Hancock, John Phillips, Nathan Webb, Paul Revere, Peter Faneuil and Samuel Adams have all played an important part in the evolution of both the city and Massachusetts, leaving behind them quite a legacy. All of these influential individuals are now interred at the Granary Burying Ground on Tremont Street. Renowned American architect Charles Bulfinch was born in Boston in 1763 and had a hand in creating a number of the most noteworthy, arresting landmarks and grand residential houses that are still standing today, although many more were demolished during the 19th century, to make way for industry. Innumerable further grand buildings were sadly destroyed during the Great Boston Fire of 1872, which swept through the city and caused more than $70 million of damage at the time, along with roughly 30 deaths. Some of Charles Bulfinch's most important constructions include St. Stephen's Church (formerly named the New North Church) on Hanover Street, the granite University Hall on the campus of Harvard (now rated as a National Historic Landmark), and the Harrison Gray Otis House on Cambridge Street. 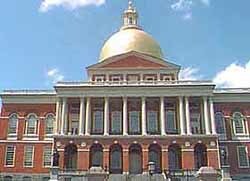 Of course, perhaps his crowning glory is the Massachusetts State House on Beacon Street, while Charles Bulfinch was also very much responsible for the original layout of the Boston Common, as well as the extending and redesigning of Faneuil Hall in 1805. Built in the latter part of the 17th century, this National Historic Landmark resides on North Square, where it stands just across from Rachel Revere Square. The house was once the residence of renowned local silversmith and American patriot Paul Revere, who is remembered for his brave 'Midnight Ride' in 1775, when he left on his horse and rode some 20 miles / 32 km to the nearby town of Concorn, the warn his compatriots at the Massachusetts Provincial Congress that British troops were on their way. 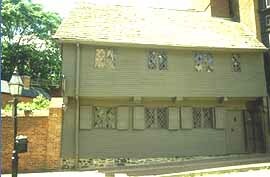 Within the house are many of Revere's former belongings and antique furnishings from the period, including some examples of his accomplished silver creations. 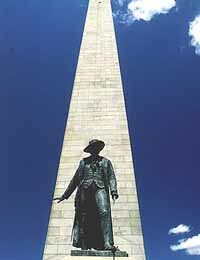 This 67-meter / 220-foot granite tower commemorates the Patriots' undaunted bravery in defeat at the 1775 Battle of Bunker Hill, one of the Revolutionary War's earliest confrontations. British troops incurred heavy losses here on Breed's Hill, and the monument was built and dedicated to this battle in 1843. This famed local landmark contains a 294-step spiral staircase, leading to the very top, where some superb panoramic views of the cityscape await. Exhibits and memorabilia explain how the British won the battle, while confirming America's hopes of winning the war. The famous Brahmin neighborhood is full of red-brick sidewalks, cobblestone streets, elegant townhouses and gas street lamps. 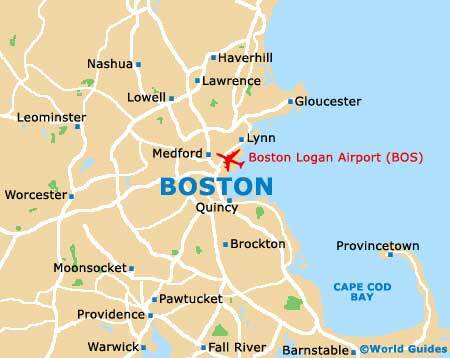 You can easily find Beacon Hill by looking for the huge gold dome of the Massachusetts State House and the undulating rows of brick houses that surround it. This is without doubt the city's most affluent neighborhood and it was once home to the Brahmins, who ran the town many years ago. From here you can watch the parliamentary maneuvers of the state legislature when it is in session, and you can also see many surrounding attractions. When Oliver Wendell Holmes called Boston the 'hub of the universe', he was thinking mainly of Beacon Hill. Visitors to the Tea Party Ship will be able to find out all about this significant happening in pre-revolutionary American history, with the story being told through a series of displays, audio visuals and relics. This ship is actually a full-size replica of an original ship used in the 1770s for the transportation of tea leaves. In 1773, colonists boarded ships like this one and threw much of the tea into the harbour, as a protest against British 'taxation without representation'. As you explore the boat, you will see the cramped conditions that the crew had to endure on their long journeys . This historic site presents some 15 different pre-Civil War structures relating to the African-American community of 19th-century Boston. All of the sites are connected by the popular Black Heritage Trail, which is around 1.6 miles / 2.5 km in length. Named after the man who was the founder of landscape architecture in the US, Fredrick Law Olmsted's home and office are included in the site, together with thousands of documents, drawings and design records of his, dating back to the 1860s. He was also heavily involved with the actual creation of the national park service. The Granary Burying Ground serves as the third-most historic cemetery in the entire city and dates all the way back to 1660. Containing some of the most noteworthy headstone carvings to be found in New England, this burial ground boasts a number of famous monuments and is where you will find the graves of John Hancock, Robert Paine and Samuel Adams, known for being the signatories of the important Declaration of Independence. Paul Revere is also buried here, along with many other important locals, such as John Endecott - the first governor, John Phillips - the very first mayor, and Peter Faneuil - a wealthy colonial merchant who personally funded the building of Faneuil Hall. This grand house was constructed in 1796 by Charles Bulfinch for Harrison Gray Otis and his wife. Otis made his enormous fortune as a very successful developer of Beacon Hill and later served as a Representative in Congress, before becoming mayor of the city. Now designated as a National Historic US Landmark, the house itself is full of classic architecture and elegant furnishings, signifying the extravagant life led by the city's aristocracy and governing class that emerged shortly after the revolution. The notable structure of King's Chapel was built in 1754, although lack of funds prevented it being finished with the steeple that its architect, Peter Harrison, had envisioned. The chapel's bell is Paul Revere's largest, while the Georgian interior is elegant and well proportioned. Adjacent is the King's Chapel Burying Ground, the city's oldest cemetery, where John Winthrop and other prominent citizens are buried. Situated alongside the entrance is the 1704 gravestone for local Elizabeth Pain, who was actually Nathaniel Hawthorne's inspiration for Hester Prynne in his romantic work of fiction in 1850, entitled 'The Scarlet Letter'. Sited within the North End of Boston, close to the Paul Revere Mall and Charter Street Park, the Old North Church serves the Episcopal Diocese of Massachusetts parish. This red-brick church was completed in 1773 in a traditionally Georgian style and features a distinctive tower, topped with a whitewashed steeple and weathervane. However, in both 1804 and 1954, the steeple suffered considerable storm damage, with the latest version measuring in at some 53 meters / 174 feet in height. Of note, it was here in 1775 where Robert Newman signaled Paul Revere during his famous 'Midnight Ride', using lanterns. This event is now reenacted on an annual basis, on April 19th. Constructed in 1729 and located on Washington Street, close to the Irish Famine Memorial and the Amtrak South Station, the centrally located Old South Meeting House is famous for the part it played during the Boston Tea Party at the end of 1773. Some 5,000 colonists met here to protest against the high British taxation charges of tea. Two years later the British took over the building due to its part in this revolutionary cause and removed much of the interior, using it as a place to ride their horses. Now ranking as a National Historic Landmark, the Meeting House will always be known for its past protests and is today used as a museum with various multimedia exhibits, whilst continuing to provide an important meeting space where local issues can be discussed. A poignant reminder of the terrible persecution of Jews during the Second World War, the New England Holocaust Memorial is situated close to both the Boston National Historical Park and Faneuil Hall. Erected in the mid-1990s, the monument comprises a series of six separate glass towers, each of which symbolizes one million Jews who lost their lives at this time in history. Various messages and squares of numbers adorn the towers, with the addition of steam and lights providing a little drama. This library preserves the historical and legal records of Massachusetts for its citizens, while the onsite Commonwealth Museum offers many formal exhibits displaying interesting artifacts. Particularly important are the Paul Revere treasures, which include an engraving plate and an actual handwritten bill that he once submitted for 'horse riding' expenses.